Update: JSC Examination Result will be published on 24 December 2018. (information from a reliable source). 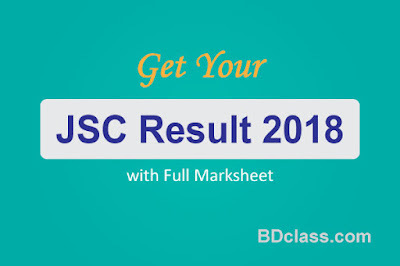 After the result being published, you can get your result through SMS and online from BDclass.com. Every education board publishes JSC result with detailed marks online on its Website. You can also get your result online with marks in each subject from your Education Boards Website. For your easiness, we enlisted all the education boards result publication website link below. JSC (Junior School Certificate) and equivalent JDC (Junior Madrasha Certificate) Exam was held from 1 November at 10.00 AM across the country. More than 24 Lac students appeared in this exam. This year, 8 overseas centers were set for the students from abroad. The education minister said that JSC exam is not a public exam but it is designed to make the students competitive for SSC and HSC exam in future. JSC exam will surely make them better experienced, competitive and prepared for later public exams. This exam also makes them engaged in studies from class 6. When will JSC exam result be published? Now all the examinee of JSC has the question in mind. You know the result is supposed to be published within 60 days of the last date of exam. (after the exam finished). So we can expect that JSC Result 2018 will be published in the last week of December. It is said that the result may be published on 24 December. How to know JSC Result? After the publication of result, you can find your result using your roll and board code through SMS. For your convenience, the process is shown below. This is the actually very valuable post, here from i benefited so thank's for sharing the valuable post.